Coal was formed millions of years ago, when the dinosaurs walked the Earth, and today the whole world is dependent on this non-renewable source of fossil fuel energy that can be found just beneath our feet. Coal is classed as a non-renewable energy that gets its name from the fact that once it has been used and burnt as coal energy, it is gone for good, it cannot be “renewed”. Over time, the Earth’s supply of coal will eventually run out, but right now, large amounts are still available to us. Fossil fuel coal can be found in abundance all over the world and for many thousands of years has been our number one source of energy. Coal is a burnable black sedimentary rock that is composed mainly of carbon and hydrocarbons and as such is one of the most important of the three primary fossil fuels. A major problem associated with the burning of coal energy is air pollution and the damaging effects that result from burning coal as a fuel. The combustion of coal emits harmful gases such as sulphur dioxide, nitrogen dioxide and acid type gases such as hydrogen chloride, which have been linked to smog in cities, acid rain and general health issues. The combustion of coal energy also emits carbon dioxide, a major greenhouse gas. Even with so many harmful side-effects, the world continues to get large amount of its energy from burning coal. But times are changing. Coal is a solid combustible sedimentary rock which is brownish-black or more commonly dark black in colour found within the rock strata of the Earth forming layers of coal energy that are called coal beds. Harder forms of coal such as anthracite coal are regarded more as a metamorphic type rock structure due mainly to their exposure to higher temperatures as well as higher pressures within the Earth forcing out oxygen and leaving behind carbon enriched coal deposits. One of the main advantages of coal as an energy source is that it is relatively cheap so has to be mined on a large scale to cover costs. Today large machines are used to dig or extract this precious coal energy by using either surface mining or deep cast mining. Another type of coal mining is called mountain top removal, which involves blasting away the tops of mountains to expose the coal. While the coal itself my be cheap, coal mining operations can be expensive to set up and run which is why surface mining accounts for about two third of the worlds coal mining production. Anyway, most of these coal reserves occur conveniently near the surface. Surface Mining: – Surface mining is less expensive than the deep cast and underground mining. This method of extraction is used for those coal energy reserves that are located near to the Earth’s surface. Large bulldozers, diggers and conveyors are used to dig out the coal which being located near to the surface, is the lowest ranked of all the coals having a high moisture and ash content, as well as lower heating value because the coal has not had enough time to form. After the coal has been extracted, the open pit is backfilled with the earth previously removed and subsequently reclaimed or restored back to its original contour. By law most mining companies are supposed to replant trees and grass to restore its appearance within the landscape, but does not always happen, leaving an ugly scar on the landscape. Underground Mining: – Underground mining is used to dig out coal seams that are buried some hundreds feet below the surface. The use of underground mining methods requires the use of elevators, ventilation, ground control, and mining methods to form a system that provides the highest possible degree of safety in the coal mine were the coal is being extracted. Depending on the location of coal deposits, there can be three different types of underground mines. A drift mine is one in which the coal seam is horizontal. A slope mine is one in which the coal seam follows the rock strata at an inclined slope, and shaft mining is were vertical shafts are drilled deep into the Earth for both production and ventilation and the coal is mined by extracting a series of rooms into the coal bed with columns or pillars used to help support the mine roof. As deep mined coal has had longer in the ground and exposed to higher temperatures and pressures, this type of coal energy is of a higher grade and is called “anthracite”. 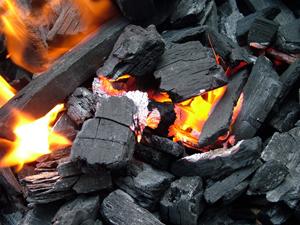 Anthracite coal contains large amounts of carbon producing the most energy when burnt. This is the black coal we see and burn in the fires. All coal begins the same as peat, but not all fossil fuel coal energy reserves are the same. Coal as a fossil fuel is classified into different ranks based on its amount of carbon and moisture content, its calorific value, or the amount of heat energy that is released when the coal is burned, plus its hardness and mineral ash content left over after the combustion process. In general, the higher the rank of a coal, the more deeply it was buried, and, therefore, the higher the temperature it was subjected to during and after their burial. Coals that are older tend to have a higher ranking value because they have been buried much deeper and for a longer period in time than much younger coals. Lignite Coal: – This is the lowest ranked type of coal and the largest portion of the world’s coal reserves are made up of lignite coal. This soft brownish-black coal has the lowest energy content and the highest moisture content as being a relatively young formation of coal it has had less exposure to heat and pressure. Lignite has a carbon content of about 25-to-35 percent and is therefore used in large quantities to produce electricity in power plants. Sub Bituminous Coal: – Sub-bituminous coal is generally a dark brown to dull black in colour coal that gives off a little more heat energy than Lignite when burnt as it contains about 35-to-45 percent carbon. Sub-bituminous coals, known as brown coal, are used for generating electricity as some sub-bituminous coals have lower sulphur content than other types giving them an environmental advantage when combusted. Bituminous coal: – Bituminous coal, also called soft coal, is the most abundant form of coal containing approximately 45-to-86 percent carbon. Because of its relatively high heat value and low moisture content, its ease of transportation and storage, bituminous coal has the broadest range of commercial uses among the coals. The heating value of bituminous coal is about two to three times greater than Lignite. Anthracite Coal: – Anthracite ranks the highest in terms of its hardness and calorific value. Its heating value is slightly less than that of Bituminous Coal but has the highest carbon content of 86–to-98 percent. This high rank coal is mainly used for industrial and home heating applications because it burns nearly smokeless, generally has less than 10% volatile matter and ash-free. The disadvantage of Anthracite coal is its low global supply. Back in the day, coal was used to heat our homes and cook our food, but today with modern gas and oil fired heating systems the number one use of coal energy is in its combustion to generate electrical power, although there are countries around the world that still use coal energy in the form of “coke” for home heating and cooking. Coal produces about 50% of the total electricity production around the world. When coal is used to generate electric power, it is combusted in large furnaces. The high pressure steam created used to run the turbines which are attached to the electricity producing generators. Then the conversion of coal energy to electric power can be viewed as a convenient use of coal. But as well as generating heat, the burning of coal also creates gaseous pollutants (like smoke and ash) and green house gas which are released during the combustion of the coal. While there are clear advantages of coal energy, there are also numerous disadvantages of using coal as a source of energy with the biggest being “pollution”. The burning of coal as a fuel gives off green house gases, e.g. carbon dioxide which is responsible for global warming. Also the pollution from lower-grade coals, whether soft or hard, is greater than higher-grade coals in terms of the quantities of ash and nitrous and sulphur oxides which are released into the atmosphere on burning. In combination with water vapour, they cause acid rain that is harmful to plants and animals. Coal mining scars the landscape and if the mining of the coal is not properly carried out then it can destroy not only the land but along with residues from underground mining can also contaminate the water supplies. Abandoned coal mines have the potential to catch fire and burn underground as well as the venting of poisonous gases and opening up of large sink holes. Over the years, coal has been indispensable in the generation of electricity. Today coal fired power stations are looking for ways to reduce the amount of pollutants and emissions created from not only the combustion process but from the mining, transportation and solids (coal ash) removal that has the potential to contaminate the air, water and the environment. As a result coal industries around the world are working together to create zero-emission coal gasification power plants that use clean coal energy technologies to filter out 99% of the airborne particles and more than 95% of the acid rain causing pollutants in the coal. Also the co-firing of the coal fuel with renewable biomass materials are now being developed and trialled. There is no doubt we need more and more energy sources to meet the world’s daily obsession for energy but it does not mean that we should use those energy resources that can most damage the environment. Switching from coal to oil or natural gas only reduces, not eliminates, carbon dioxide emissions. While the future of Coal Energy generation is certain to continue as it plays too significant a role in generating electricity, coal energy plants are slowly making their way to the back burner as natural gas and renewable energy starts to take center stage. While the contribution of renewable energies is still small compared to that of fossil fuel coal, switching to hydro-power and renewables (wind, solar), would help eliminate greenhouse gas emissions entirely, but even these renewable sources of energy have their own unique set of problems to be overcome. To gain a better understanding of how “Fossil Fuel Coal” was formed, or to obtain more detailed information and tutorials about the various types of non-renewable resources available on the planet, then Click Here today to get your copy from Amazon of one of the top books about Coal Energy Systems, fossil fuel coal and other non-renewable energy sources.